What to do with a leftover ham bone? There’s nothing better than a hearty soup (bean, lentil, split pea, you get the idea). So put that ham bone to use, and make one more amazing soup before your thoughts turn to warm weather outdoor grilling. How about White Bean and Potato Soup? You can make this recipe without potatoes, but I like to include them because they add extra flavor, and their starch helps thicken the soup. You can use any kind of white bean in this soup, but in the US, Great Northern beans and Navy beans are the two most readily available. I prefer Great Northerns. If you elect to use Navy beans, do note that cooking time may be somewhat less than for Great Northerns (usually about half an hour less). First, you need to begin making a stock with the ham bone. (This is a soup, so tasty stock is important.) You need a minimum of an hour and a half to develop good flavor, but I think 2½ hours is better. Second, because Great Northern beans take about an hour and a half to cook, you’ll need to add them about an hour into the stock-making process. You’ll also add sautéed onions and garlic at this time. Depending on how thick you make the soup (how much water you add), this recipe makes about 5 quarts — enough to feed a crowd. Leftovers freeze well. This recipe takes about 2½ hours total; active time is 20 to 30 minutes. Although there are quite a few steps to this recipe, the preparation isn’t difficult. Read through the steps a time or two and you’ll discover that it’s a straightforward dish to prepare. Pick over beans (to remove any dirt or stones) and soak 8 hours or overnight in enough water to cover by several inches. (See Notes for quick-soak method.) I usually leave the beans out on the kitchen counter overnight, but you can refrigerate them if you’re worried that they may start to ferment. About 2½ hours before you want to serve the soup, place ham bone or ham shanks/hocks in a large pot (at least 6 quarts). If using ham shanks or hocks, rinse first. Peel and halve onion, and add to the pot. Add the 12 cups water, bring to simmer, and skim scum that will form. Simmer for one hour (this is to develop stock). By simmer, I mean tiny bubbles are rising to the surface and breaking; we’re not talking any kind of boiling action. At the hour mark (or a bit later; time isn’t critical for this step), drain the beans (Step 1) and add them to the pot with the ham bone. Peel and dice additional onion (I like ¼-inch dice, but anything up to ½ inch is fine); wash, peel, and dice carrots (if using); and wash, peel, and dice celery (if using). Peel and mince or slice garlic (I like to slice because I enjoy biting into largish pieces; most people prefer minced). Heat frying pan on medium heat. When hot, add oil. Immediately add diced onions, garlic, and carrots (if using), plus celery (if using). Season with salt and pepper, and sauté until onions are translucent (about 5 – 8 minutes). Add dried thyme and (optional) pepper flakes; sauté for about 30 seconds (to flavor the oil); add contents of frying pan to pot with ham bone and beans. Meanwhile, scrub, peel, and cut potatoes into dice of ½ inch or a bit less. Cover with cold water so they don’t discolor. Check beans after they’ve been cooking for an hour. They should be soft, but not yet cooked. If they’re still hard — this may be the case if the beans are old — keeping cooking them until they’re almost, but not quite, done. Drain potatoes and add to the pot. Adjust water level in pot if necessary to achieve the consistency you prefer. Set timer for 20 minutes. Right after you set the timer, remove ham bone (or shanks), let cool briefly, then remove meat from bone. Dice into bite-size pieces. Remove the onion halves (that you added in Step 3) from the pot, and add the diced meat. When the 20-minute timer goes off (Step 13), test beans and potatoes for doneness (both should be soft but still hold their shape). Cook a few more minutes until done if necessary. When done, if you want the soup to have a less chunky, more homogenized texture, you can use a stick blender to liquefy it. (Be aware that if your stick blender has a plastic shaft, the hot liquid may crack it). Adjust seasoning and serve. A chopped parsley or Homemade Crouton garnish is a nice finishing touch. Why soak dried beans? Because they cook much quicker when you rehydrate them. Most beans benefit from soaking. However, because lentils and split peas cook fairly quickly without rehydration, you can use them without soaking. A secondary benefit is that while rehydrating, the beans also release some of their flatulence-inducing sugars (oligosaccharides) into the water. When you discard the soaking water, you discard a few nutrients that have leeched into it. But you also discard some of the substance that can cause people to shy away from dried beans. Ham bone is great in this dish if you have one on hand. But if you don’t, substituting smoked ham shanks or hocks works well — their flavor is similar. Ham shanks have less bone and more meat than ham hocks, so I prefer them. The bone, however, does give good body to the stock. Quantity isn’t critical in soup making, though you should use at least 1 pound. I prefer a bit more, up to 2 pounds. If you have a ham bone but aren’t ready to use it right away, wrap it well in cling wrap or foil, put it inside a freezer bag, and freeze for up to a month. The ham bone should give your broth a nice ham flavor. But , wrap it well in cling wrap or foil, put it inside a freezer bag, and freeze for up to a month. The ham bone should give your broth a nice ham flavor. But if you want to up the flavor quotient, you could add a tablespoon or so of ham base (commercially prepared ham stock that’s been reduced to a paste). My favorite brand is “Better than Bouillon,” which many supermarkets carry (you can also order it from Amazon). I’ve heard great things about Minor’s Brand, though I haven’t used it. They sell primarily to restaurants and other commercial entities, but individuals can order through their website. Either Great Northern or Navy beans work in this recipe. I virtually always use Great Northern beans, for no particularly good reason except that I like them. If you prefer Navy beans, go for it — but remember that their cooking time tends to be a bit less. However, if you cook them longer it’s no tragedy in this dish (it’s a soup!). Although celery and carrots are common in bean soups, I find they don’t add a great deal to this one. But use them if you prefer. Although the recipe specifies 1½ pounds of beans, you can easily up that to 2 pounds if you prefer. Just add a bit more water to the pot. A Homemade Crouton garnish is nice on this soup. If you decide to do this, you can make them while the soup simmers in Step 11. This isn’t a quick recipe, so you’ll want to prepare it on a day when you’re around the house — perhaps on a weekend. However, as noted above, it freezes quite well. You can take this from the freezer, put it in a saucepan with a bit of water, and be eating soup in about 20 minutes. When reheating, you’ll want to watch the pot a bit after the first 5 minutes so the soup doesn’t scorch on the bottom of the pan. Just stir it from time to time to prevent this. 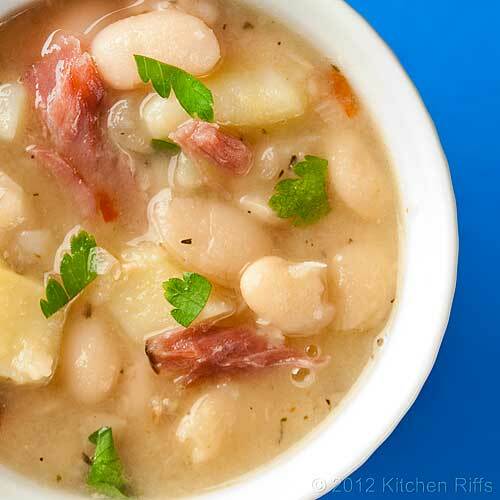 Soup is always my favorite way to use ham bone — particularly soup made with legumes or pulses. If you’re not in the mood for white beans, split peas are another good option. Just follow the directions for Split Pea Soup with Greens but substitute ham bone for the ham shanks. (You can omit the greens if you prefer.) Because ham bones typically weigh more than ham shanks, you may want to increase the quantity of split peas to a pound and a half or two pounds. You could also make a pinto bean or black bean soup using the same formula. And ham bone is traditional when making Red Beans and Rice (a recipe I haven’t yet written about, but will someday). If you don’t want to make soup, you could use your ham bone to make a ham stock: Follow the directions in Steps 2 & 3, but reduce the amount of water so there’s just enough to cover the ham bone. Simmer for at least 2 hours, until tasty. Cool, put in freezer containers, and freeze until you’re ready to make soup (or do something else with the stock). This will be my last hearty soup recipe until autumn, but I’m not done with beans, which are a year-round staple (at least chez Kitchen Riffs). In hot weather, there’s nothing more refreshing than White Bean and Tuna Salad, for example. So expect to see a few more bean dishes in the months ahead. I’ll be posting about ways to prepare Mexican/Tex-Mex Beans, and how to turn hum-drum canned baked beans into a dish that rivals any traditional long-cooked recipe. That last one is perfect for picnics and barbecues — which I’m looking forward to as warmer weather approaches. Oooooh this sounds and looks delicious. Only 5 days left to enter for this months food blogger event THE SOUP KITCHEN, here all bloggers are welcome, hope to see you participate soon. I haven't made a ham bone, white bean soup in ages!!! I don't know why because I love them. I have no idea where my recipe might be (if I even have one), so thanks for posting this. Your recipe is perfect! Hearty, healthy, a depth of flavors and genuine comfort food! Hi Debs, I'll check it out! Thanks for the reminder, and for stopping by. Hi mjskit, it's good stuff, isn't it? I love soups of all descriptions, but bean soups are the best. And nothing beats the flavor of a good ham stock. Thanks for your comment. I have a gigantic ham bone waiting in the freezer for this dish. I didn't know what to do with it after Easter - now I do! Hi Mother Rimmy, ham bones are valuable resources! Glad I've given you an idea for using it. :-) Thanks for commenting. 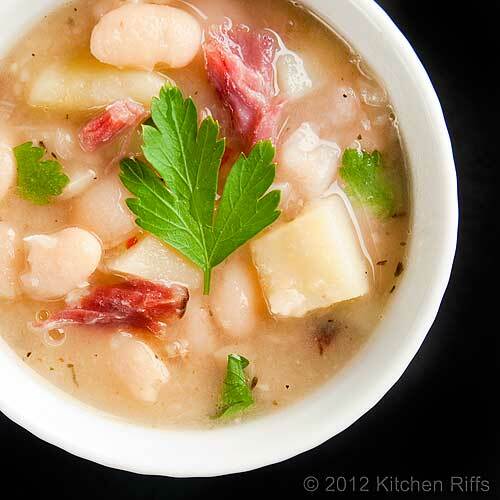 Your white bean and potato soup looks absolute delicious! Ham bone or ham hock stock is just the best for bean soup. I like to keep some ham hocks handy in the freezer for when we need a hearty soup especially on rainy days like today. Hi Biren, that's a great idea to keep ham hocks in the freezer. You never know when the craving for bean soup might arise, so it's best to be prepared! Thanks for taking time to comment. Sounds soothing and delicious. Thanks! Hi This is How I Cook, it's really good. Best thing about it (any bean soup, really) is you make such a big batch, you have plenty of leftovers to freeze. I really like leftover soup - great for when I don't have time to cook. Anyway, thanks for stopping by. Hi Carolyn, :-) Very funny! Really like the idea of using ham bone in Chinese porridge. I don't often make congee, but next time I do I'll have to try that. Thanks for the tip, and for taking time to comment. I always end up making split pea soup with my ham bone but I'm definitely going to try this with the next one. Looks beautiful. Hi Maureen, Split Pea Soup is great too, and I often make that. 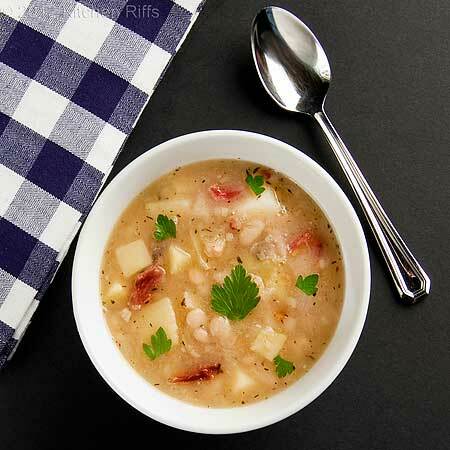 White Bean soup has a creamy smoothness that's pretty irresistible, though. Nice to have choices! Thanks for commenting. Bean soups are fantastic. I love how rich and hearty this looks with the potatoes! Hi Lisa, aren't they great? During cooler months it always seems I'm cooking some sort of soup made out of dried legumes or pulses. Thanks for taking time to comment. I was sure I replied to this but I guess not. 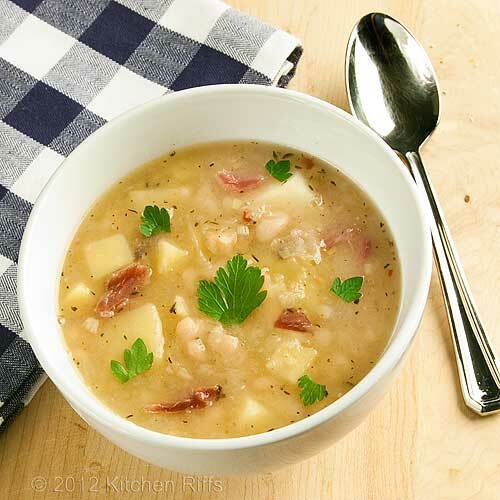 I adore hearty soups like this and your White Bean and Potato soup looks so comforting. I'm not sure I could say this is the last time until Autumn for a soup like this. If the weather gets chilly again I'll be making some. With the way our weather has been this year, it could snow in August! Hi Vicki, maybe you did reply - I sometimes experience the same thing, when I thought I replied to someone's post, and my reply disappears into the ether. I guess blogging software is sometimes buggy. Anyway, the weather has been strange, hasn't it? And of course in the southern hemisphere snow in August is expected! So I expect I'll still be making hearty soups, just not posting about them! Thanks for taking time to comment. This looks like such a healthy and delicious soup. Love it! Hi Asmita, it is! It is! Both healthy and delicious. I like most soups, but have a real weakness for bean soups. Thanks for stopping by. What a comforting delicious soup! I love potatoes so when I see them as one of ingredients for the soup, I was excited. Looks delicious! Hi Nami, potatoes + beans = happy taste buds! Truly a blissful combo. Thanks for commenting. Always have my eye out for a new soup to try! Definitely will be putting this on the to-make list! Hi Patty, I'm always trying new soups, too. We do a lot of main dish soups because they're so easy and so incredibly tasty. Bean soups are particularly nice. I think you'll like this. Thanks for your comment. Wow, this sounds really, really good. Right up my alley. Hi Patricia, glad you like it! It really is a nice soup - I hope you enjoy making it. Thanks for your comment. Mmmm...I'm making this now. Glad I ran across your post. Popping in a couple of french baguettes after they rise. Pretending it is already fall! Hi Mere, baguettes would be wonderful with this! And I'm ready for fall. :-) Thanks for the comment.